Alabama Police Shot EJ Bradford In Back, Family Says: 'My Son Was Murdered' Emantic "EJ" Bradford Jr. was fatally shot by a police officer on Thanksgiving. Now, the black man's family says autopsy evidence demonstrates that the officer should be "charged with murder." 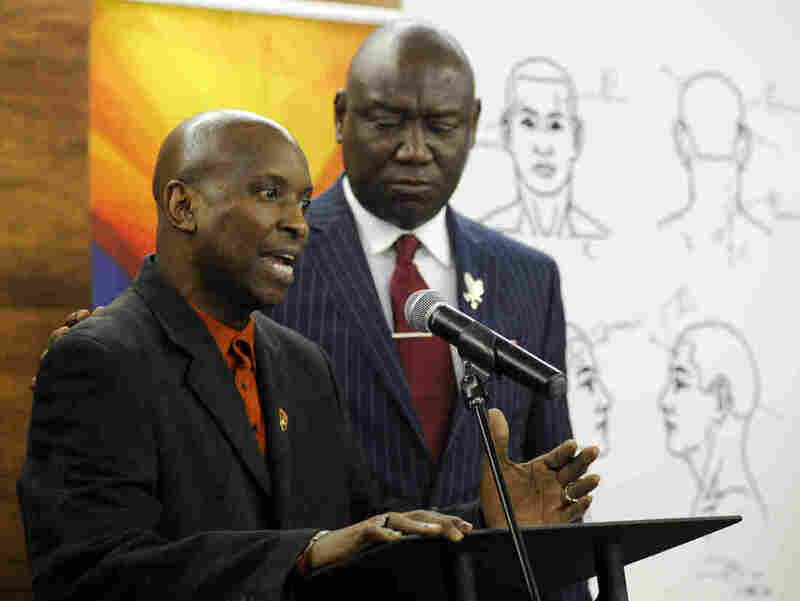 Emantic Bradford Sr. (left) discusses the results of a forensic examination on his son, EJ, who was fatally shot by police on Thanksgiving. Flanked by attorney Ben Crump, the elder Bradford addressed a news conference Monday in Birmingham, Ala.
An independent autopsy has found that Emantic "EJ" Bradford Jr., a black man killed by police on Thanksgiving night, was shot three times from behind during the incident in an Alabama mall. Lawyers for Bradford's family released the results Monday, saying they confirmed he had been fleeing with his back turned at the time he was killed. "We believe, based on this forensic evidence, that this officer should be charged with a crime," attorney Ben Crump told a news conference in Birmingham, Ala., flanked by Bradford's father. The autopsy commissioned by the family showed that Bradford had been shot in the head, neck and lower back, all from behind. It was the gunshot wound to the head that killed him, according to the report, which concluded that the "manner of death is homicide." "There's nothing that justifies [the officer] shooting EJ as he's moving away from him. You're not a threat when you're running away," Crump continued. "If that was anybody else who shot somebody three times in the back, it would be justified that they be charged with murder." 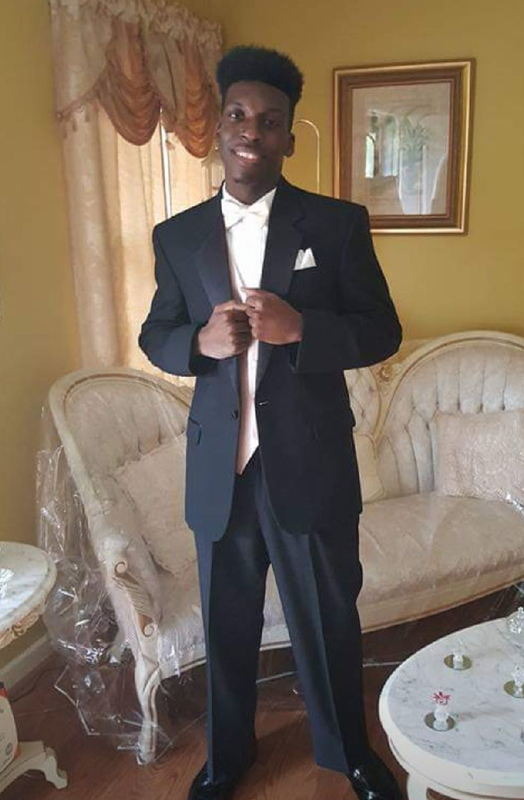 Bradford, 21, was killed after an altercation erupted at the Riverchase Galleria Mall in Hoover, Ala., a suburb of Birmingham. Initially police applauded the "heroic" actions of the officer on the scene, who has not been publicly identified. The original police statement also blamed Bradford for the confrontation, claiming that he had whipped out a weapon and begun shooting during an incident that left two people injured. Later the Hoover Police Department retracted that claim. Officials said that Bradford had pulled out his own handgun, "which instantly heightened the sense of threat to approaching officers responding to the chaotic scene." But the police department also added that it was "highly unlikely" Bradford had been the one behind the attack. The actual suspect, Erron Martez Dequan Brown, was arrested last week. Since the shooting Bradford's family and other activists, including the Rev. Jesse Jackson, have pushed for law enforcement officials to release the official autopsy results and video of the deadly incident. During the news conference Monday, Jackson told reporters that "to not release the tapes is a cover-up." Emantic "EJ" Bradford Jr., seen posing in an undated image provided by his father. Thus far, local officials have resisted the pressure to release the information, asserting that it would be "premature to do so." And Hoover Police Chief Nick Derzis said the decision was made at the request of the state secretary of law enforcement, Hal Taylor. The agency that Taylor oversees, the Alabama Law Enforcement Agency, has opened an investigation into the circumstances surrounding Bradford's killing. "Secretary Taylor reiterated the importance of maintaining the integrity of their investigation. He has specifically asked that we do not release any potential evidence as it may not only jeopardize the integrity of the case, but also complicate or delay their efforts," Derzis said in a statement released Monday, adding. Hoover City Councilman Derrick Murphy also pleaded for understanding. "I am disappointed that we cannot give the Bradford family the answers they deserve faster," Murphy said in a statement of his own. "Please be patient with me as I struggle to balance the privilege of being an elected official in the City of Hoover with the flinching of being an African-American following tragic circumstances like these." Those responses failed to convince Bradford's family, however. Bradford's father, Emantic Sr., blinking back tears at times, offered forceful words of his own at Monday's news conference. "My son was murdered by this officer. And that was cowardice," he said, shifting to address the absent officer. "You shot a 21-year-old person running away from gunfire. Never pose you a threat. Never had nothing in his hand. Why did you shoot him? You can't explain that to me because that ain't training. That's cowardice. You're a coward."